This is a plugin which creates a widget for Q5 Media’s Arrow Email Marketing system to easily a the newsletter subscription form onto your WordPress site. Simply install the plugin and add the widget to the sidebar of your choice and enter the details to link it to your newsletter list with Q5 Media’s Arrow Newsletter System and away you go, expanding your database of email addresses of people interested in your product/service/knowledge. Download the plugin and then unzip the file, then in your WordPress admin, visit “Plugins” > “Add New” > “Upload” and upload the file. 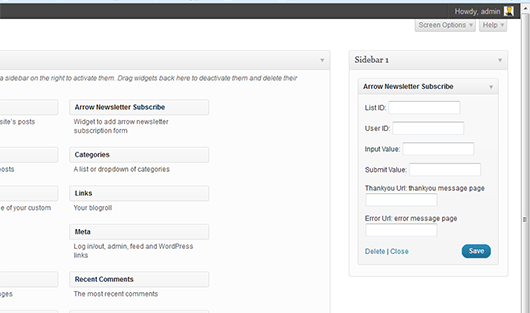 Click Save and test on your site that the subscription form works and enjoy your subscription roll in.